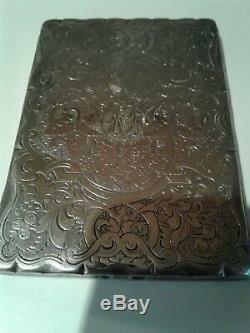 A very fine antique Victorian solid sterling silver card case Birmingham 1869 made by FM. Beautiful fine hand engraving, silk lined interior, with original silver pencil (small dents to the top of pencil). With wipe able leaves each day of the week , very early diary Weight 103 Grams Length 97 mm Width 68 mm. The item "ANTIQUE VICTORIAN SOLID STERLING SILVER CARD CASE BIRMINGHAM 1869" is in sale since Saturday, March 24, 2018. This item is in the category "Antiques\Silver\Solid Silver\Card Cases".